The International Justice Resource Center (IJRC) provides technical assistance to Indigenous rights lawyers working to stop the forced sterilization of Indigenous women in Canada and to secure redress for victims. Since November 2017, we have partnered to secure and pursue multiple international human rights advocacy opportunities. By engaging with the Inter-American Commission on Human Rights, United Nations Committee against Torture, United Nations Special Rapporteur on violence against women, and Commission on the Status of Women, we have amplified our partners’ message and impact. This collaboration has resulted in multiple strong statements from human rights bodies, the Canadian government’s acknowledgment of its responsibility for forced sterilization of Indigenous women and its commitment to implement our proposed reforms and measures of redress, and significantly increased public awareness. Numerous national and international media outlets, including the CBC, Guardian, Newsweek, and National Public Radio (NPR) have recently covered this issue and these efforts. IJRC is providing technical assistance and guidance to the lawyers, including attorney Alisa Lombard, who represent Indigenous women who have been forcibly sterilized in Canada. This work is part of IJRC’s Advocacy Support program, through which IJRC provides advocates with advice on human rights advocacy opportunities, guidance and support in pursuing those opportunities, and technical assistance including legal research and writing. The following paragraphs detail the: the pattern of forced sterilization of Indigenous women in Canada, the advocacy opportunities IJRC has secured with our partners in Canada, and the documents related to those interactions. Indigenous women in Canada have been subjected to forced sterilization in public hospitals, going back many decades and into 2018. This practice appears to disproportionately, and possibly exclusively, target Indigenous women. Dozens of victims have come forward on their own since late 2017, but the full scale of the problem is unknown because there has been no comprehensive investigation, and due to a lack of publicly available data. Attorney Alisa Lombard represents several women in civil litigation against the relevant healthcare providers and governmental entities alleged to be responsible for forcibly sterilizing them. They are seeking certification of a class action on behalf of all Indigenous women forcibly sterilized in Saskatchewan. Doctors most often perform these sterilizations when the woman is in labor or is immediately post-partum, using a tubal ligation procedure that permanently prevents her from becoming pregnant again naturally and that can have profound consequences for her and her family. Some known cases involve women being sterilized despite expressly denying consent, while other women are unduly pressured, and others are simply not asked. A forced sterilization is one performed without the woman’s free, prior, full, and informed consent. International human rights law has clearly established that forced sterilization violates multiple human rights and is an act of gender-based violence. See our four-page overview of recent decisions and statements on forced sterilization, and our webpage on forced sterilization for more information. 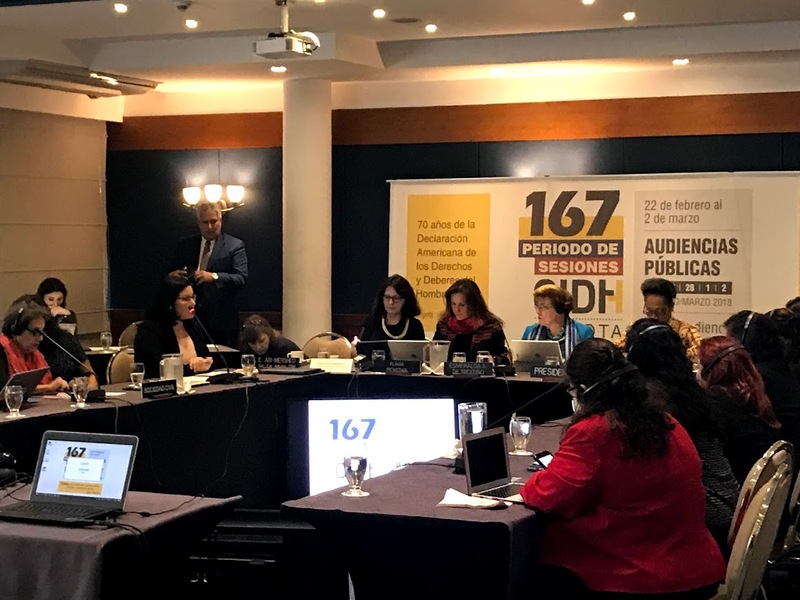 IJRC assisted Alisa Lombard and her colleagues in successfully requesting a hearing before the Inter-American Commission on Human Rights (IACHR). On February 27, 2018, the IACHR convened a hearing that included the topic of forced sterilization of Indigenous women in Canada. At the hearing, Alisa Lombard detailed the known pattern of forced sterilization of Indigenous women in Saskatchewan, in particular, and recommended specific government action to prevent future violations, including through addressing discrimination in the public healthcare system. In connection with the hearing, we submitted additional detailed information in writing. The Commissioners expressed alarm and dismay upon learning that Indigenous women continue to be forcibly sterilized in Canada, and that there has been no accountability for these abuses. The United Nations Special Rapporteur on violence against women, Dubravka Šimonovic, also participated in the hearing and shared the IACHR Commissioners’ concern. In a subsequent hearing, the IACHR publicly questioned the Canadian government about its efforts to ensure changes in policy and practice. In response, the Canadian government acknowledged its role in forced sterilizations of Indigenous women through its responsibility for managing the public healthcare system, and pledged to share the documentation in its possession. The government has also promised to implement the reforms we proposed. These were encouraging and meaningful steps forward. 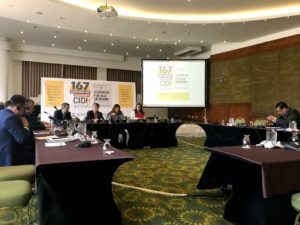 In May 2018, IJRC and Alisa Lombard attended the 168th Period of Sessions of the Inter-American Commission on Human Rights in Santo Domingo, Dominican Republic to further inform the Commissioners about this issue, including through bilateral meetings. In January 2019, the IACHR published a detailed press release dedicated to the problem of forced sterilization of Indigenous women in Canada, in which it called on the government to take specific measures including investigating these allegations, collecting data on sterilizations, holding accountable those responsible, criminalizing forced sterilization, and ensuring reparations for victims. In March and April 2018, IJRC assisted our Canadian partners in contributing to the oversight of the United Nations Special Rapporteur on violence against women, including in her April 2018 country visit to Canada. In several meetings and written submissions, Alisa Lombard and her colleagues informed the Special Rapporteur about the ongoing and unresolved problem of forced sterilization of Indigenous women in Canada, and arranged for the Special Rapporteur to hear directly from survivors. At the end of her visit, the Special Rapporteur called on Canada to take “urgent action on systemic violence against indigenous women.” The Special Rapporteur’s report on her visit to Canada, in which she is expected to review areas of concern and recommend specific government actions, will be submitted to the UN Human Rights Council in 2019. In May 2018, Canada underwent its third Universal Periodic Review, a peer review process that examines the human rights records of UN Member States. Thanks to coordination and awareness-raising with other civil society organizations in Canada, forced sterilization of Indigenous women was included among the topics raised during the interactive discussion with Canada held on May 11, 2018 in Geneva, Switzerland. The State of Argentina concretely recommended that Canada “[t]ake the necessary steps to investigate complaints lodged regarding the forced sterilization of women from vulnerable groups and, where appropriate, punish those responsible and assist affected women.” Watch the video recording (at 54:51) to see the representative of Argentina make this recommendation. The documents related to the UPR are available online. The Canadian government accepted Argentina’s recommendation (number 212). During the “constructive dialogue” between the CAT and Canadian government delegation, the CAT raised the points made in our written submission. In particular, the CAT rapporteur (point person) for Canada’s review, Sebastien Touze, said that forced sterilization of Indigenous women is a violation of the Convention against Torture, is “tantamount to torture,” and reflects the systemic discrimination against Indigenous women. He further called out the complete lack of administrative or criminal investigation, and called on Canada to criminalize forced sterilization and ensure an access to a remedy and redress for survivors. Watch the video recording. In its oral response, the Canadian government committed to improving healthcare for Indigenous women, and implementing the recommendations made to it before the Inter-American Commission on Human Rights (see our submission below) in 2018, regarding ensuring informed consent. The CAT responded that Canada’s obligations include providing reparation, investigating allegations, implementing measures to ensure non-repetition, and punishing those responsible. The Committee is concerned at reports of extensive forced or coerced sterilization of indigenous women and girls dating back to the 1970s and including recent cases in the province of Saskatchewan between 2008 and 2012. According to the information before the Committee, at least 55 women have contacted lawyers representing indigenous women who have filed a pending class action lawsuit against doctors and health officials at a Saskatchewan public hospital for undergoing tubal ligation procedures without proper consent. The Committee takes note of the information provided by the delegation on the external review on this matter launched by Saskatoon Health Region (which later became part of the Saskatchewan Health Authority) in January 2017, but remains concerned at the lack of information regarding the implementation of the calls of action included in the final report, especially those related to reparation (arts. 2, 12, 13, 14 and 16). The State party should: (a) Ensure that all allegations of forced or coerced sterilization are impartially investigated, that the persons responsible are held accountable and that adequate redress is provided to the victims; (b) Adopt legislative and policy measures to prevent and criminalize the forced or coerced sterilization of women, particularly by clearly defining the requirement for free, prior and informed consent with regard to sterilization and by raising awareness among indigenous women and medical personnel of that requirement. 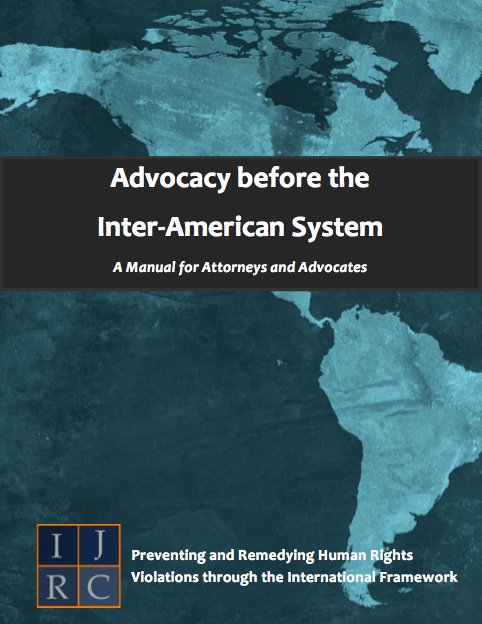 In its January 2019 press release, the Inter-American Commission on Human Rights echoed these findings and recommendations. the Inter-American Commission on Human Rights is the regional human rights monitoring body in the Americas. It has jurisdiction over Canada and the 34 other members of the Organization of American States. Learn more in the manual and informational video below. The UN Special Rapporteur on violence against women is one of several dozen experts and groups of experts (“special procedures“) that the UN Human Rights Council has tasked with monitoring and reporting on specific human rights concerns around the world. The UN Committee against Torture is one of 10 “human rights treaty bodies” connected to UN human rights treaties, and is responsible for assessing State parties’ implementation of the Convention against Torture, including through periodic reviews and individual complaints. Canada has been a State party since 1987. The Universal Periodic Review is a peer review process overseen by the UN Human Rights Council, through which each UN Member State’s overall human rights record is assessed every four years.